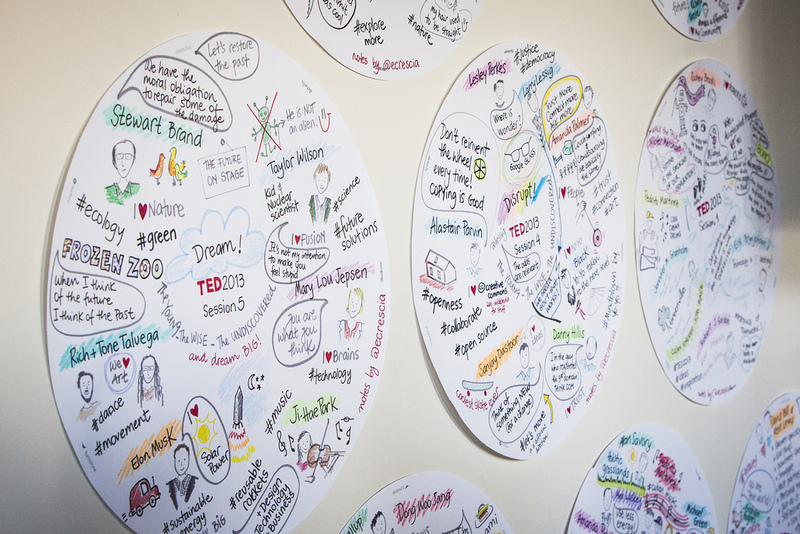 During each and every talk streaming live to TEDActive, you will find artist Gavin Blake of Australian graphic facilitation group Fever Picture feverishly doodling notes and quotes from speaker tales in real-time. 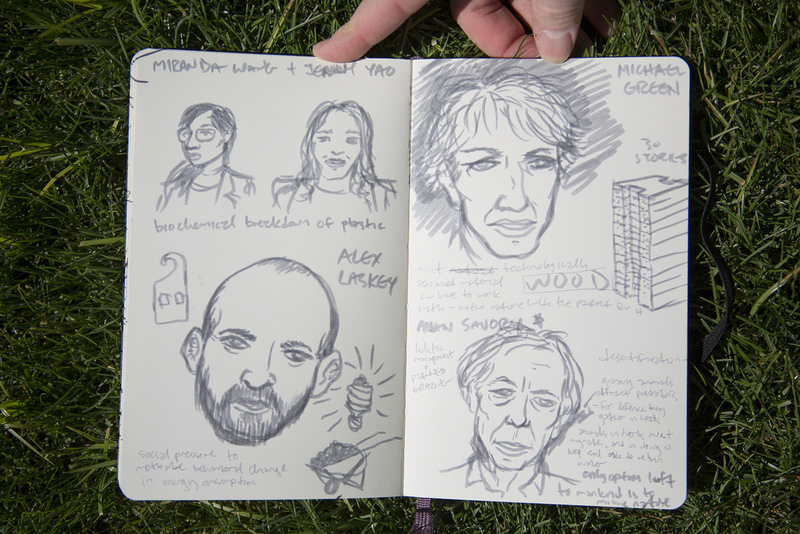 We were curious about Gavin’s process, so we asked him for some tips on how to take really awesome graphic notes. He drew us a diagram of his process above, which we love. We’ve included some of our favorite visualizations from Gavin below. You can see the rest on his Facebook page here. Listening is really important. You want to respect the conversations taking place. You’re listening for those little nuggets that will make good visual quotes. You have to keep the process going between visualizing and drawing. Log the current thought in your mind and visualize what’s being spoken about in the moment. When I draw what I draw, it’s inevitable that certain things will fall through the cracks. Do what you’re capable of. Keep working. Keep practicing. 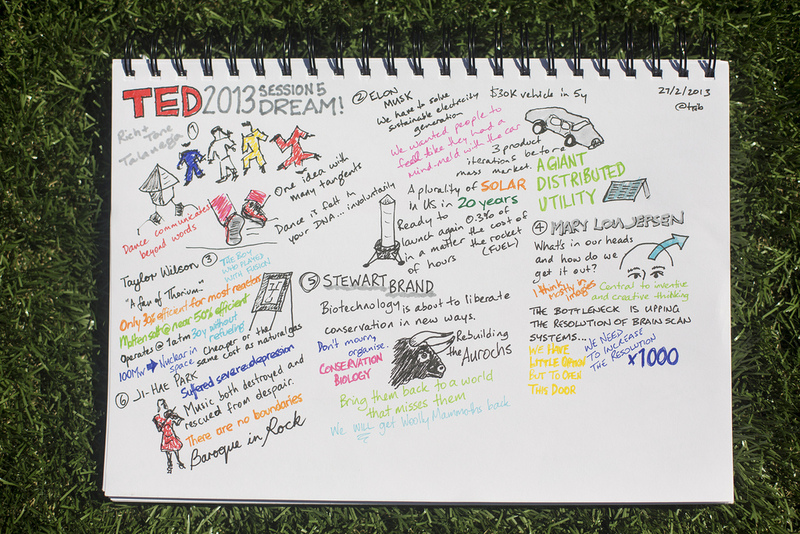 We were also very inspired by the graphic notes of some of the TEDActive attendees. Elena Crescia (@ecrescia) of TEDxJardins posted her round session notes on the wall of the Creative Lab after each session. We love the way Stephen Collins (@trib) uses color in his notes.